The VOIspeed telephone switchboard has a centralized Corporate Phonebook, within which public contacts (visible to all users) and private contacts (for the exclusive use of those who entered them) coexist. By accessing the Address Book area ( Toolbox – Address Book ) it is possible to view the contacts already present in the address book in alphabetical order, filtered by initial letter of the surname and company. You can also order all the contacts in ascending or descending order by category (Company, Owner, Name, Surname, Company). NOTE: the section shows only public contacts (visible to all). For privacy reasons, the contacts entered by users via the GUI are as private contacts (therefore not visible) will not be shown either to the administrator or to the super administrator. By clicking on the button you can add a new contact. You can immediately specify, in the information field, if all users can or cannot modify the contact. 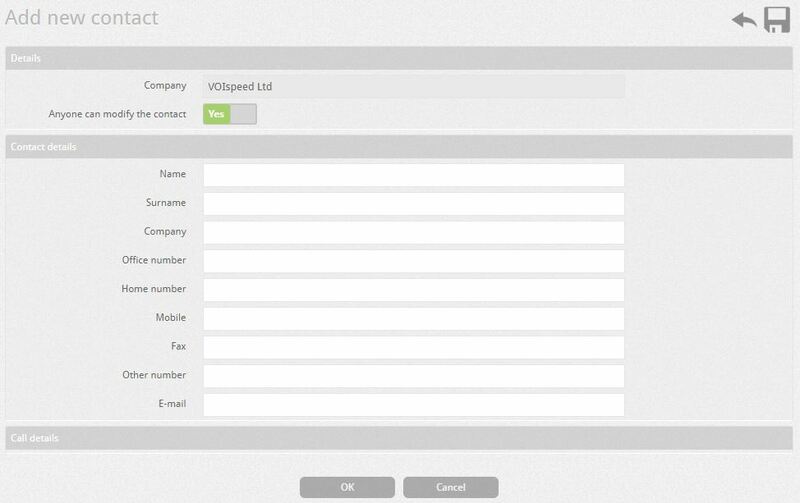 In the section below, Contact Information, the contact data fields appear. By clicking on the button you can import an entire external address book saved in a text file (.csv). Load from: allows you to download the file from your PC or from a remote URL. The file must be filled in according to the format shown below (which can also be viewed by pressing the button ). Field separator Choose (;) in the case wherein the source file the chosen field separator is the semicolon, choose (,) in case it is a comma. Simulate import Perform an import simulation to check if the file is correct and/or if it contains errors. Any errors are shown at the end of the import. Delete File at the end of the process Once the import is completed, the source file will be deleted.